Thanks to an early wet season, a warm winter and summer-like temperatures, trees are in full, fresh regalia across northeast Oklahoma. I planted this Bald Cypress tree in my parents’ yard about 8 years ago and it’s already 25 feet tall. 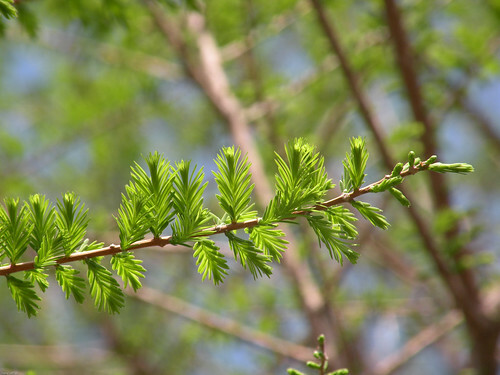 Bald Cypress has become one of my favorite trees in that time, for its fine leaves, lacy bark, naturally beautiful shape and its sheer resilience. No trees weathered the ice storms of 2007 like the Bald Cypress. I try to plant a tree every year on Arbor Day, but have missed a few years, so this year, I planted eight trees: two Bald Cypress, two Tupelo Blackgum, two Tulip Poplar, one Loblolly Pine and one Chinese Elm. In no time, they’re going to be big, beautiful, full trees. Trees keep all us mouth-breathers alive. So give thanks to our woody friends!